History, as we all know, is written by the victors. Every single thing that we read has been put together by someone who has, perhaps, their own agenda, or a slant on history – or any other subject – that they wish to promote. Sometimes it is to balance matters out, sometimes to settle a debit or even a score, but nothing is truly balanced and honest. The difference with history is that, once it is taught, it tends to become lore, to become a firm, a solid part of the identity of a country. So the English are keen to show how their Empire was great and beneficial, and will subdue anything published which shows those times in another light. The Spanish will have their own set of events they wish to promote above all other versions. The present Russian government follows the line of those who came after the Revolution, and the justification for the killing off of the Romanovs. The present Chinese government follows the pattern of its Glorious Leader and the wisdom he imparted in the same fashion. So, too, with the United States. Here, in the case of changing names and of removing monuments, even more disinformation is being propagated, according to the aims of one party or another, one set of citizens as opposed to the rest. There are interests concerned which we cannot possibly see through, which we can neither imagine nor justify and which, I suspect, would be so convoluted when brought to light, even the most serious and deep thinking detective would have a problem to get to the real cause. You write that it is the government which is causing the change of names for various public buildings and institutions, but that is not the case. This government has kept out of the debate to a remarkable extent, apart from supporting those who violently oppose changes by calling them Good People, and that despite the murder of people who had been calling for change peacefully and within the letter of the law. It is the institutions themselves, the universities and colleges, which are changing their attitudes and, after some long debate, deciding whether the name of a known slave owner, of a civil war criminal or of someone else whose reputation does no good to the standing of the United States as a whole, or a State or county within the Union, should be retained or removed. It is rarely a snap decision by a few people on some trustees board, but a long process of debate, of definition, of soul-searching. And the statues which are being removed? They are predominantly to slave owners and civil war “heroes” of the Confederate army, erected not immediately following the end of hostilities, but as a result of the Civil Rights Movement in the Sixties. 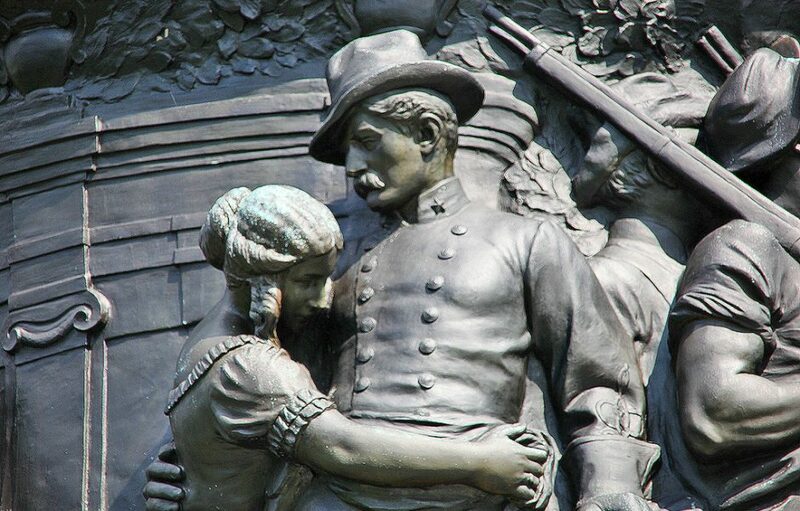 Many of these statues and memorials were erected specifically to subdue those who campaigned for the Rights of their fellow Americans, cast out because of the colour of their skin or the origin of their parents and grandparents. They were erected in a hurry, some overnight, to show a position of strength and to suppress, rather to truly commemorate someone who had done good and was worthy of a memorial. They were made out of cheap metal and, now, as they fall, that lack of solidity is shown as these statues collapse and are crushed by their own weight. And, again, their removal has not been a snap decision, but one of debate, of loudly outspoken animosity, of violence performed against fellow citizens. A fake history of heroes is slowly being dismantled, and everyone given a chance to look into the past, to reassess their knowledge of it, and to find better ways to unite and make an area – a town or village, a city, a county – worth living in again, regardless of ethnicity or political colour. Rewriting all the history books is also something which the federal government is not involved in, but State government. Textbooks covering history, biology, religion, anything taught in schools, are decided upon and effectively censored or controlled by State educational boards at the highest level, and county boards at a lower level. What is taught in Texas is not the same as that which is taught in Ohio, Kentucky or New York. In some areas, books on biology are required to state that evolution has not been proven. In some areas Harry Potter is a book you will not find on public library bookshelves. In some areas it is claimed that southern States voluntarily removed themselves from the economic reliability of slavery, and that slavery had no part in the decision of some States to secede from the Union. The limitations on what should be taught in schools doesn’t come from the government in Washington D.C., although I am sure Betsy DeVos would love to have total control for her exclusively conservative opinions, politics and religion, but from the individual States and their legislature. Central government is only involved in financing some forms of education, and those they prefer rather than those which are most needed – which is why we hear so many stories of teachers spending their own money to buy supplies for their pupils (n something not confined to the United States). I sometimes wonder why we have such public memorials at all, not that I would cast them all back into the smelting pit and have railroads made from their ore, but more because what we learn over time, what gradually comes out as historians assess the truth behind the public image, makes many unworthy of their fame. People who were responsible for millions of unnecessary deaths, or for the harm of children and the defenceless. Racists who, while they did manage to rescue a country from a massive foe, did it for the sake of country, and thought of that country as being purely white, Anglo-Saxon, and upper middle class and above. I have no problems with their great feats being memorialized, but their failings should never be glossed over as if they were some form of superhero, and not an ordinary person called out to temporary greatness, as so many others are who do not gain any recognition. At the same time, what they have done, for the good of all, should not be eclipsed by one or two bad moments, for a political failing or anything similar. That would be like saying someone who has committed a crime can never be rehabilitated, can never again be a member of civilised society and accepted into our midst. I don’t know whether the last few weeks have been the same for you, but we have had scorching temperatures and a distinct lack of rain. There have been hose pipe bans, and requests to be careful with garden ponds and swimming pools, and many, many complaints that, after a reasonably mild winter which no one remembers enjoying, the weather is too hot. The fact that no one can be happy no matter how good things are never escapes me: those who demand heat when it is cold are the same who need cold when it is hot, and complain incessantly. Today I am grateful it is not too hot as, during the afternoons when I write many of my letters, I would normally have the sun falling right across my back, and be unable to move from the heat. When it is hot I am grateful for the good weather, when it is cold I am grateful for the change. There is nothing I can do to influence what we experience, so it is better to accept and adapt, in my opinion, than waste time and energy complaining. Of course, I would be eternally grateful if some of those people busy polluting our atmosphere would stop so that we can return to a balanced climate, but sitting here and swearing, or complaining in a local bar over a beer some evening is not going to bring that about. Yesterday I was out and about in Bremen, mainly checking the flea market for additions to my small photographic collection, but also to meet up with and chat to friends, drink and cooling beer and enjoy time along the river front. Sensing that something was amiss, I hurriedly bought myself a rain jacket – reduced from a high price to a fairly reasonable middle one, and then by a further thirty percent when I checked out – and had the pleasure of a sly look from the salesperson as I told her not to wrap it, I’d be wearing it outside. The store is, as I am sure you can imagine, one of those concrete constructs with no windows, so those working inside to not notice changes in the weather, or even the passage of time. Needless to say, I walked out of the store, and was greeted by a thunderstorm of wonderful proportions, which caught everyone unprepared. People sheltering in coffee shops and store doorways in their t-shirts and short trousers, while I sauntered down the street in my new jacket. The rain was much-needed, but, of course, people complained it came at the wrong time. I could quite happily sit on a porch swing in the spring, summer and autumn as at an outside bar, just watching people and time go by. Sometimes it is good to take a break and just do nothing, just sit and watch, let the atmosphere of a place seep into your mind and body as if nothing else matters. Sometimes it is good to vanish from this world into the world of another person’s imagination, and sit and read a book or enjoy a good film in the cinema. I often wonder whether people who use their smart phones all the time, never looking up and what is going on around them, gain the same feeling, although I doubt it very much. I read a complaint from a museum director recently, where he said it was wonderful having so many younger people coming in to be in front of the works of art, but all they did was stand with their backs to some of the greatest masterpieces of all time, snap a photograph and move on. They probably didn’t even see what it was they were capturing in their digital memories. It’s a shame about your journals. I, too, would never want my own words and thoughts to fall into someone else’s hands and be subject to their scrutiny; at least, not while I am alive. There are deep and meaningful things in there which many others, including my family, would never understand, as well as records of the things I have done in my life which could shock a few and turn others green. I am fortunate in that my writings are all in English, so it would take a while before someone here could understand them, and handwritten, so almost illegible. But I write my journal for me, not for anyone else, and supplement it with my letters. I do, of course, have the advantage of living alone, of having no one who casts an eye over my every movement and decides what I am allowed to do, to say, to think and what I am not. If it were any way other than this I would still write my journal, perhaps in another form, and have a safe place to send it outside the gaze of those who have no real need to see inside me, inside my mind. I wonder, from all the people who write journals, how many of them try to keep their thoughts secret, and how many have partners who do not even know that their actions are being transcribed. I suspect more than one would imagine. For me a journal, like a letter, is a private thing unless the writer chooses to share it. I certainly wish you well with the second part of your certification process, and hope you gain the grading that you desire and that you need. I have never given Braille too much thought, never having needed it, but come in touch with it almost every day of my life. Many of the signs here, for crossing the road or using an ATM at the bank, have Braille instructions embossed on them. I am sure that, when the time comes and you get a chance to practice what you have learned, you’ll have just as much pleasure in sharing things with people as those who are enabled by your knowledge, which is as good a reason to learn and to succeed as any. I say, what a delightful blog and so many articles of interest. Thank you!